Proteins are the building blocks of life and amino acids are the building blocks of proteins. The protein foods we consume contain amino acids in various proportions. 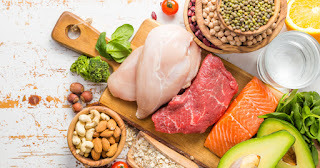 When protein intake is too low to meet the body’s needs over time, it causes a type of malnutrition that, in its most extreme form, is known as kwashiorkor. Integrative medicine practitioner Fred Pescatore, MD, MPH, who is president of the International and American Association of Clinical Nutritionists, ranks amino acids as among the most important components of the diet. “There are 22 amino acids that we have to have in our body,” he stressed. The A-List Diet has been a worldwide best-seller, along with other books authored by Dr. Pescatore that include Feed Your Kids Well and The Hamptons Diet. Dr. Pescatore is also the author of Thin for Good, The Allergy and Asthma Cure, and The Hamptons Diet Cookbook. While The Hamptons Diet focused on the benefits of a Mediterranean-style diet and healthy fats, The A-List Diet emphasizes the importance of the amino acids in our food. The Standard American Diet (whose acronym, SAD, should tell you all you need to know about its effects), with its abundance of processed food and nonnutritive carbohydrates, fails to supply an adequate amount of amino acids needed by the body for good health. Making simple changes in our food choices in favor of whole foods and healthy protein sources will go a long way toward ensuring we obtain the amino acids our bodies need. During the 1990s, Dr. Pescatore began to notice a change in people’s approach to wellness. “It changed my life being able to watch people take vitamins, exercise, and be healthy,” he observed. As a physician, Dr. Pescatore’s own approach changed as well, and he now utilizes a wellness model as opposed to an illness model of health. Like what Dr. Pescatore has to say? Listen to the Live Foreverish podcast with Life Extension’s Dr. Michael Smith and his guest Fred Pescatore, MD, MPH, as they discuss Amino Acids, by visiting LiveFOREVERish.com. If you like what you hear, please take a moment to give Live Foreverish a 5-star rating on iTunes! Semba RD. Ann Nutr Metab. 2016 Aug 30;69(2):79-88. Marsh KA et al. Med J Aust. 2013 Oct 29;199(suppl 4):S7-S10. Phillips HN et al. PLoS One. 2017 Nov 3;12(11):e0187686. Razminowicz RH et al. Meat Sci. 2006 Jun;73(2):351-61.